The Sit Tax-Free Income Fund invests primarily in investment-grade municipal bonds that pay high current income exempt from federal tax with preservation of capital. The income is free from federal regular income tax as well as the federal alternative minimum tax, which can be especially helpful for investors in higher income tax brackets. The Fund opened in September 1988 with an investment objective focused on income, which the managers believe is responsible for the majority of a bond fund’s return over a full market cycle. To achieve its objective, the Adviser tends to favor higher-yielding sectors such as housing, healthcare, and educational facilities. Additionally, the Fund invests more in revenue bonds than general obligation bonds for the same reason. Revenue bonds are backed and paid by the revenues generated from a facility or other specific revenue source, and usually have higher yields than general obligation bonds, which are backed by the taxation powers of a municipality. Non-rated bonds provide another source of incremental yield for the portfolio. Non-rated bonds come from municipalities that forego having an independent agency rate their issues. Generally, the higher the credit rating, the lower the interest cost (coupon) to the municipality so it makes sense to pay for the rating process. However, that may not make economic sense if the issue is small in size or if it would likely receive a low credit rating. Sit’s investment team finds opportunities in this space by analyzing non-rated bonds and assigning ratings to them using the same metrics as the various rating agencies, and then selecting issues with higher yields relative to similarly rated bonds. Risk management is a very important part of this strategy. Portfolio managers normally keep durations within a specified range of the benchmark, the Bloomberg Barclays 5-Year Municipal Bond Index, to reduce interest rate risk. Credit risk is lowered by investing heavily in investment grade securities, and thoroughly researching non-rated bonds. Focusing on higher credit quality issues that generate significant cash flow and provide stable prepayment characteristics such as housing-related bonds helps significantly decrease liquidity risk. The Fund is also diversified, and maintains holdings across geographic regions as well as a broad selection of securities with the average holding making up less than 1% of the portfolio. The Fund’s income advantage has been a strong driver of performance over the years, and annual total returns for the 1-, 3-, and 5-year periods ended June 30, 2018 were 4.31%, 4.51% and 5.21%, respectively. 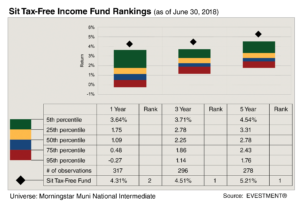 As shown in the adjacent graph, Morningstar®, Inc., an independent mutual fund rating service, ranks the Fund in the top 5% for all of these same periods. For investors seeking income, the Fund’s 30-Day SEC Yield as of June 30, 2018 was 2.69%, which equates to well over 4% on a taxable-equivalent basis for those in the highest income tax bracket. Fixed-income markets face challenges ahead as the Federal Reserve slowly pressures interest rates higher by raising short-term rates and unwinding its balance sheet. We expect to see tax-exempt rates also climb especially for shorter maturities, and the municipal yield curve to flatten. Our strategy will focus on income by emphasizing higher quality, long-term housing issues and other bonds with short call provisions and higher coupons to limit extension risk. As always, diversification will remain a key tenet in managing portfolio credit risk.